New Zealand is a country of rare seismic beauty: glacial mountains, fast-flowing rivers, clear lakes, hissing geysers and boiling mud. There are also abundant forest reserves, long, deserted beaches and a variety of fauna and flora. Any number of outdoor activities such as motorbike riding, kayaking, hiking, skiing, rafting and of course, bungy jumping - await the adventurous. You can swim with dolphins, whalewatch or fish for trout in the many streams. The people, bound in a culture that melds European with Maori ancestry, are resourceful, helpful and overwhelmingly friendly. Because New Zealand is such a compact country with empty roads and something new to discover around every corner, it is ideal for the motorcycle tourist. There is an abundance of well run camping grounds in every town as well as in quiet remote areas. The north of New Zealand is subtropical and the south temperate. The warmest months are December through to the end of March. In summer, the average maximum temperature ranges between 20-30ºC. Vaccinations: No vaccinations are required to enter New Zealand. The majority of visitors arrive in New Zealand by air. There are three airports that handle international flights: Auckland (the major exit/entry point), Wellington and Christchurch. The currencies of Australia, the UK, USA, Europe and Japan are all easily changed in New Zealand. You'll have no trouble with the major travellers' cheques and credit cards. Banks will give cash advances on Visa and MasterCard, but for American Express card transactions you must go to an American Express office. The dominant cultural groups are the Pakeha and the Maori. Other smaller groups include Yugoslavian Dalmatians, Polynesians, Indians and Chinese. A common thread that binds the entire population is its love of sport - especially the national game of rugby union - and outdoor pursuits such as sailing, swimming, cycling, hiking and camping. The secular aside, Christianity is the most common religion, with Anglicanism, Presbyterianism and Catholicism the largest denominations. An interesting religious variation is the synthesis of the Maori Ratana and Ringatu faiths with Christianity. English and Maori are the two official languages. English is more widely spoken, though the Maori language is now making a comeback thanks to the revival of Maoritanga. The first settlers in New Zealand were migrants from Polynesia. Kupe, the Polynesian navigator, has been credited with the discovery of New Zealand in 950 AD. He named it Aotearoa (Land of the Long White Cloud). Their culture developed over centuries without any discernible outside influence, until the arrival of the Europeans. In 1642, the Dutch explorer Abel Tasman briefly sailed along the west coast of New Zealand; any thoughts of a longer stay were thwarted when his attempt to land resulted in several of his crew being killed and eaten. In 1769, Captain James Cook circumnavigated the two main islands aboard the Endeavour. Initial contact with the Maoris also proved violent but Cook was impressed with the Maoris' bravery and spirit and recognised the potential of this newfound land. 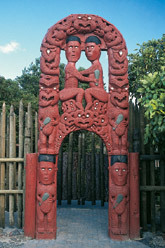 In 1840, the Treaty of Waitangi was signed between Maori and Pakeha (European settlers). Then in 1860, war broke out between them, continuing for much of the decade. The fighting eventually died down, and though there was no formal resolution, the Pakehas claimed victory. By the late 19th century, things had calmed down. The discovery of gold had engendered much prosperity, and wide-scale sheep farming meant New Zealand became an efficient and mostly self-reliant country. The Maori population is now increasing faster than the Pakeha and a resurgence in Maoritanga (Maori culture) has had a major and lasting impact on New Zealand society. Culturally, the most heartening aspect had been the mending of relations between the Maori and Pakeha (in 1985, the Treaty of Waitangi was overhauled, leading to financial reparations to a number of Maori tribes whose land had been unjustly confiscated).